Alex Prunty Racing: 2nd Career Start in the Super Late & Alex Comes Home Top 5! 2nd Career Start in the Super Late & Alex Comes Home Top 5! 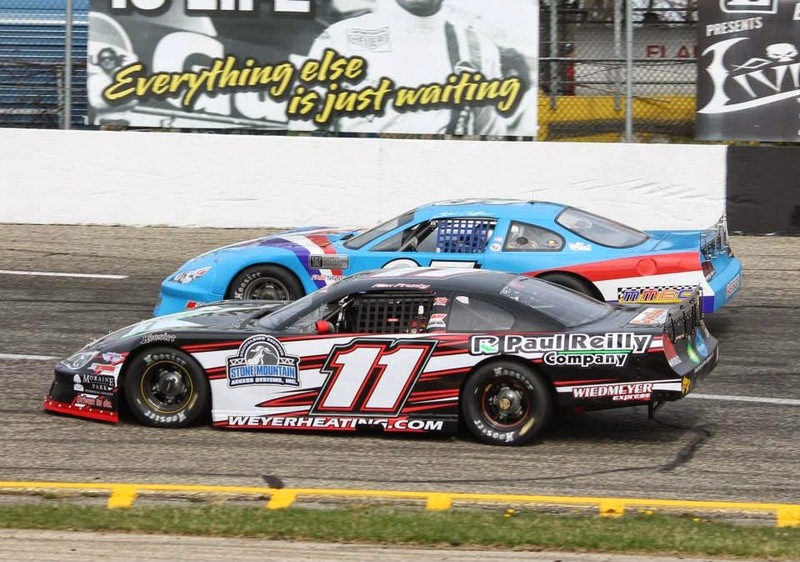 The Super Late Model race at Dells Raceway Park quickly turned to chaos as they came out of corner number two on the second lap. The front row of Ken Reiser and the number 44 of Mike Lichtfeld got together, causing Lichtfeld to spin directly in front of the field. The 25 of Jeff Storm, 87 car driven by Collin Reftner and the number 11 Bobby Kendall where all victems of the wreckage. Storm and Kendall where able to drive their cars into the pits. Unfortunately, the 87 car diven by Reftner had to be pulled off the track with a wrecker, ending his night early. Neither Reiser nor Lichtfeld honored the Gentleman's Agreement by claiming fault of the wreck, resulting in both drivers losing their positions on the front row and they where both sent to the back of the pack. Before our Flag man Arne Thompson was able to bring the field back to green flag racing, Ken Reiser pulled into the pits for an unknown reason and Kendall was able to make it back onto the track to take the restart. As the cone was put out on the back stretch, Frank Nitzke and Tim Schendel chose the outside groove behind the leader of Alex Prunty. As the green flag was dropped, an immediate combat broke out between Schendel and Ben Pettis for the third position. For a short while, Pettis was able to hold off Schendel but not for long! It only took 6 laps of green flag racing for Tim Schendel to work around Pettis and slide past Nitzke into second place. After being sent to the back on the first lap, the 44 machine of Lichtfeld was able to gain 7 positions in only 10 short laps! Schendel was able to obtain the lead from Prunty, but Prunty was holding on strong to the back bumper of Schendel. Pettis and Nitzke fought a long hard war against each other for the fourth position, Brian Johnson, Jr. took the opportunity to follow Pettis past Nitzke. With thirty laps to go, Greg Pawelski was still holding onto a strong 5th place position. As Prunty gave it his all on the outside lane to hold off Pettis, he just couldn't hold on long enough. With Pettis in second and 24 laps to go, Cory Jankowski spins on his own while exiting turn 4. After a short caution, Schendel immediately pulled away from the field, Pettis took second and Johnson fell into third. Just before 10 laps to go, Lichtfield passed the 17 of Johnson. During the last ten laps, a lot of space accumulated between the top three drivers. As they approached the 5 laps to go mark, Storm was able to close in on Prunty, which detonated an exciting side by side battle for 5th place. Ultimately Storm came up short, finishing in 6th place. "We all need a little luck now and then." Tim Schendel said gratefully referring to his victory, especially after a difficult off-season. Second place driver, Mike Lichtfeld was a class act and presented the crowd with a great interview and even apologizing for accidentally getting into fellow driver (Johnson) during the race. I believe I speak for all spectators who where in attendance as I issue a huge thank you to all of our Super Late Model drivers for always providing a compelling display of power, sportsmanship and simply good, enjoyable racing!